Tip: Learn how to choose among the many different cooking oils available for nourishing food that tastes great! The cooking oil section of your grocery store may leave your head spinning with the overwhelming number of choices. Healthy fats and oils are essential for overall health, absorption of nutrients and delicious-tasting food, but it can be difficult to know which support your health and which you should avoid. By understanding what to look for in a healthy oil and which are best for different cooking purposes, you can avoid the confusion and choose oils that help your family feel their best and make great tasting food! 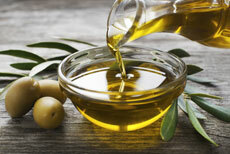 What Makes an Oil Good or Bad? Monounsaturated fats are abundant in olive, avocado, canola, high-oleic safflower and sunflower oils; these fats may help reduce LDL (bad) cholesterol and triglycerides and raise HDL (good) cholesterol levels. Polyunsaturated fats include omega-3 and omega-6 fatty acids. Omega-3 fatty acids are abundant in flaxseed and chia seed oils; they may help lower cholesterol, blood pressure, and reduce inflammation. Omega-6 fatty acids are abundant in safflower, grapeseed, sunflower, wheat germ, corn, walnut and cottonseed oils. Most Americans eat more than enough omega-6s and should reduce their consumption of these fatty acids. Saturated fats are abundant in coconut, palm kernel and fully hydrogenated oils. The Dietary Guidelines for Americans recommends you consume less than 10 percent of your calories from saturated fats; however, certain types, like lauric acid found in coconut oil, may not have the negative health effects of other saturated fats. Trans fats should be avoided entirely. These bad fats are abundant in any oil that is “partially hydrogenated”; they raise bad cholesterol and lower good cholesterol levels, while increasing your risk of developing heart disease, type 2 diabetes and stroke. Low- to medium-heat cooking – Use extra-virgin olive oil, organic expeller-pressed canola oil or coconut oil for low, moist-heat cooking methods like braising, stewing, steaming and poaching. High-heat cooking – Choose an oil with a high smoke point, like avocado, sunflower or refined organic expeller-pressed canola oil, for searing, deep-frying and stir-frying. Use spice rubs instead of marinades when grilling. Dressings and dips – Oils high in monounsaturated fats, like extra-virgin olive oil, or omega-3 fatty acids, like flaxseed oil, are ideal for non-heat cooking and salad dressings. Try Chef Marshall’s Garden Chicken-Quinoa Salad with one of its three dressings: Lemon-Chive, Dill-Dijon and Ginger-Miso Vinaigrette for irresistible salads that highlight the flavor and nutrition of these healthy oils. Even when you start with a “good” oil, exposure to light and heat can transform it into a “bad” oil by altering its chemical structure and turning it rancid. Store oils in a tightly capped bottle in a cool, dark place. Some oils, including flaxseed oil, are best stored in the refrigerator. Use oils only once, and avoid heating them above their smoke point. Oils add essential nutrition and flavor to the foods you eat. Understanding which oils support your health and when to use them helps you prepare foods that are not only delicious, but support your wellness. Stock your pantry with a variety of healthy oils for all your cooking needs.